An office renovation is a good way to boost the aesthetic appeal of the space. The positive changes that you bring to your office environment can influence the first impressions of visitors and the mood of employees. 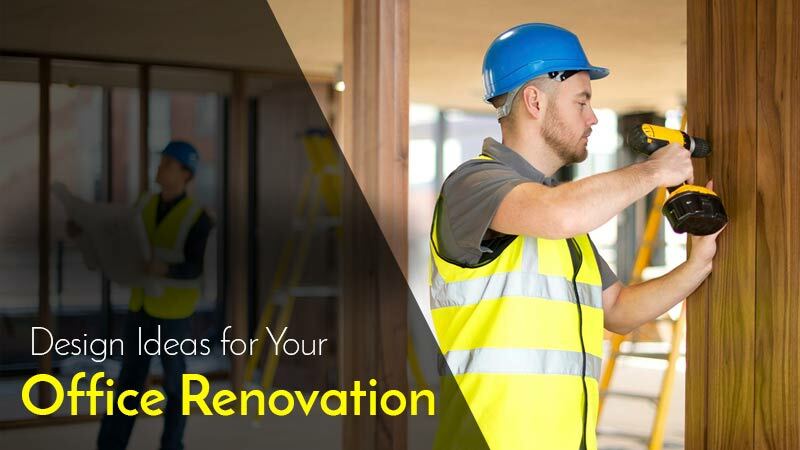 But a successful office renovation can be challenging because the changes that you introduce should be able to motivate your team and prospects. You also need to make sure that the budget, time, and effort you’re investing gives you the desired result. In today’s blog post, we’ve put together some simple yet effective design ideas for your office renovation, whether you need upkeep or you’re moving into a new office space. Flooring plays an important role in creating the first impression whenever someone steps into your office. It’s the most accessed area in your office which is why damaged or worn-out flooring make for a dull and uninspiring look. Carpet, tiles, and vinyl are popular flooring choices for open-plan offices as these materials have good sound absorption properties. To maximize collaboration opportunities between employees, many employers consolidate the workspace. New office renovation projects favour heads down workspaces instead of individual cubicles and desks. Benches offer excellent flexibility as more employees can sit together with laptops and desktops at work, and they can also move around easily to discuss work with different colleagues. Having proper storage solutions in your office is very important to store and organize your documents and files appropriately. Multi-utility filing storage cabinets are an ideal solution to keep everything organized. They perform several functions to make daily operations easy and clutter-free. Your files and folders can be categorized and stored by employees making it easier to reach for the right information. These cabinets also help in safeguarding your documents from damage, loss or theft. Choose the material and style for your cabinets depending on your needs and budget. Besides heads-down workstations, consider creating some breakout spaces. These alternative workspaces are an integral part of any modern office. They’re fun and offer a less formal environment to boost the creativity and productivity of your employees. These spaces include colours, bright fabrics, comfortable seating and funky furniture pieces to facilitate a very relaxing environment for collaboration, conversation and discussion. If you want to give a full makeover to your bland office, add bright colours to the space. They help to introduce vibrancy, energy, and a sense of personality into the office space. Bright colours can also be used as an extension of your branding. If you’re looking for high-quality office renovation solutions, contact Kitchen Nation. We can help you choose the right design for your office based on your requirements and budget. At Kitchen Nation, we use only top-grade materials to create inspiring office interiors. Our architects, creative team, and installation experts are committed to providing a relaxing space for your employees.